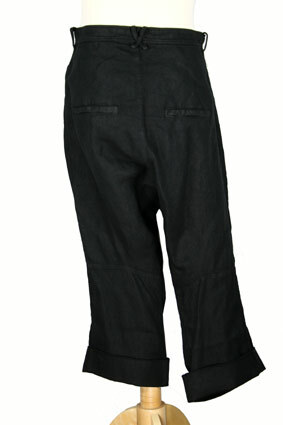 Rundholz Dip Collection over-dyed, basket-weave, cotton/linen low-crotch trousers in black colour. Belt loops (crossed loops at rear) and extra long buttoned fly with placket and buttoned tab at waist band. 2 side pockets. On left thigh there is a small pocket with flap. 2 pocket at the rear. Panel construction. These are real special trousers, beautifully designed. Can be used with a turn-up if required, they are shown with leg hems turned up.